In principle the argument is correct. For a graduate student who has completed a course on International Economics, the above argument is obvious. This belief carries over to the practising economists, and journalists who consult the economists. That's why we read a lot of criticism of the government when tariffs are raised - as they lead to breaking away from GVCs, or rather in India's case, not getting integrated into them. A simple case where a duty of 10% is levied every time a component crosses the border in the journey through the value chain, where a value addition of 30% takes place at each step, leads to a situation where the prices build up pretty fast as can be seen in figure below. 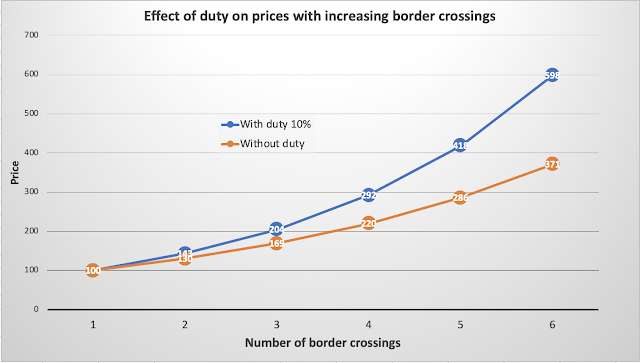 Starting with an initial value of 100, the component start showing significant difference in price by the time it crosses a dutiable border the third time, showing that a country with even a 10% duty at border becomes a drag in the value chain, and is liable to be opted out of the chain. Thus the logic holds. In practise the above argument is not as parsimonous. The argued tariff effect on GVC participation is exaggerated. Lest I be misunderstood, let me state here that high tariffs are always a blunt instrument to use and I am not a supporter of blanket high tariffs on goods, especially the ones that are part of GVCs. However, the argument that tariffs at the border are sole reason for India not getting into GVCs is flawed. Here's why. India, and most other countries, work under the principle that "Goods are exported, taxes and duties are not" when it comes to exports. One may call it by various names ranging from 'zero rating of exports' to 'duty nullification schemes', but the fact remains that policy practitioners all around the world understand this problem and devise means to counter this effect when it comes to goods that are re-exported with/without value addition. Such schemes also do NOT run counter to the Agreement on Subsidies and Countervailing Measures (ASCM) at WTO. c) Dedicated duty free enclaves such as Special Economic Zones and bonded manufacturing zones such as EOUs. I am aware of such schemes being run in many countries and there can't be any objection of these schemes at WTO. In addition, India also enters frequently into various trade agreements with partners where duty free access is provided. I consider the non-tariff barriers (NTBs) more important than tariff measures which are countered through these schemes. In addition to NTBs, India also suffers from relatively poor infrastructure, longer distance and hence travel times, poor investment in industries, and lack of economies of scale in manufacturing sectors where GVCs are prevalent (e.g. electronics/semiconductors) and such other factors that matter more in GVCs than a simple border tax that the free trade theorists abhor. The above needs to be kept in mind when we argue against a mere border tax effecting our chances at participating in GVCs. Do business reforms lead to better export performance? 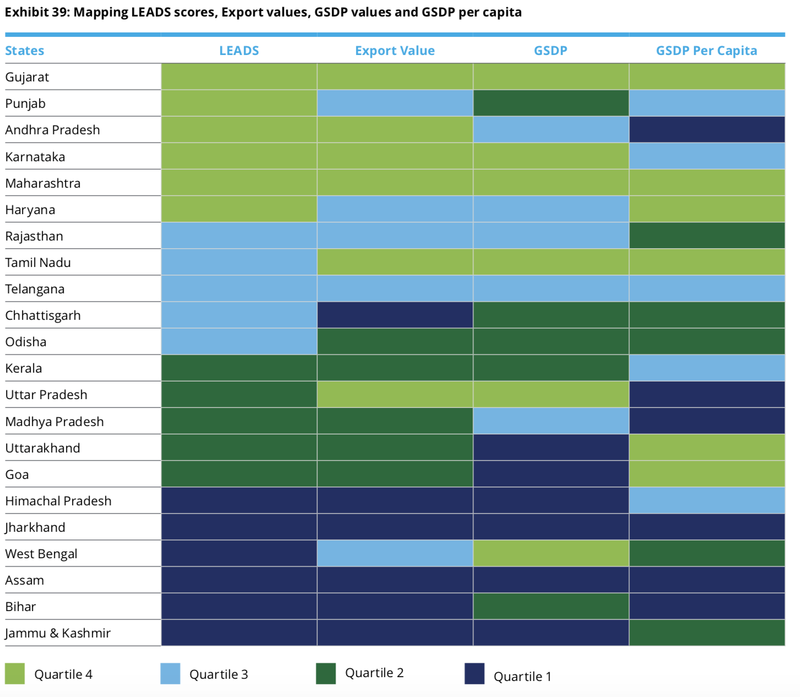 Are there any other measure(s) that correlate with export performance by Indian states? We can measure merchandise export performance of states against Ease of Doing Business and also against the Logistics Ease Across Different States (LEADS) index for some preliminary understanding of the matter in Indian context. India has a Business Reforms score that measures the individual states in terms of ease of doing business, on similar lines as that of World Bank's (WB) Ease of Doing Business (EoDB). This is to help identify the reforms required to make doing business easier. The score card - let's call it EoDB for the sake of the simplicity - is maintained for all states and union territories of India. LEADS index is relatively new. It has been created on the lines of World Bank's logistics performance index and covers various states and union territories of India. The 2018 report prepared by Deloitte for ministry of commerce can be found here. The below table (mostly self explanatory) of various states with their merchandise export intensity with respect to their GDPs is compared with LEADS and EoDB scores shows that there exists a stronger correlation with respect to LEADS and merchandise exports (correlation coeff. of around 0.65) and lesser with regard to EoDB (correlation coeff. of around 0.4). Even visually, it can be seen that LEADS scores seem to better correlate with export performance over EoDB score. This may be primarily due to the inherent methodology differences. 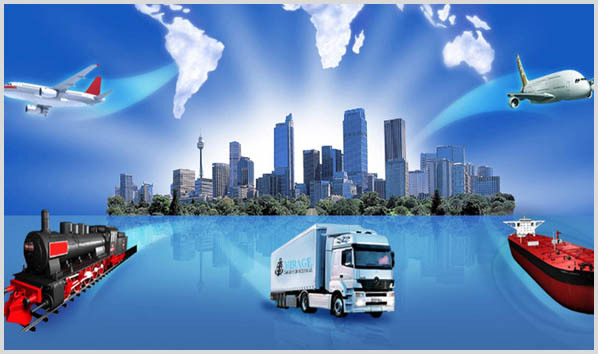 LEADS covers an important determinant of export performance - the ease of logistics. 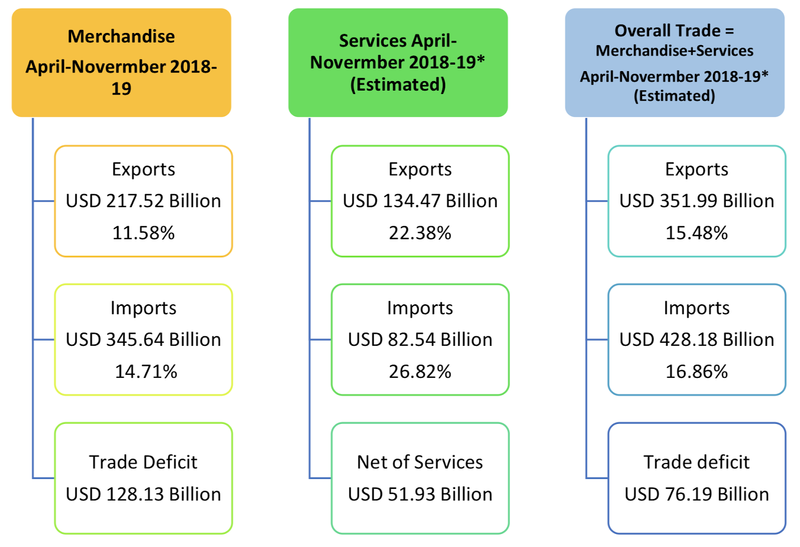 At this rate, we would end up with an annual deficit of around 192 Billion USD, a significant jump from a deficit of around 162 Billion USD during last financial year. The below are the numbers for last financial years imports listed in descending order of value of imports (excel online may take time to load). The first item in the list, the mineral fuels and oils, is a necessary need as India doesn't produce any oil. Out of the imported crude coming under this chapter, we refine and export around 38 Billion USD refined petroleum products. Thus the net deficit is around 94 Billion USD. This is the fuel oil bill for India every year. The second item in the list, the pearls precious stones and metal, mainly constitute of imports of diamonds and gold. India is the largest diamond polisher, and one of the biggest gold importer for domestic consumption. Under this chapter, India exports out around 42 Billion USD, bringing the net imports to around 32 Billion USD. The third item in the list is worrisome. The import bill is around 48 Billion USD, and growing each year, and we don't have any significant exports in this chapter. 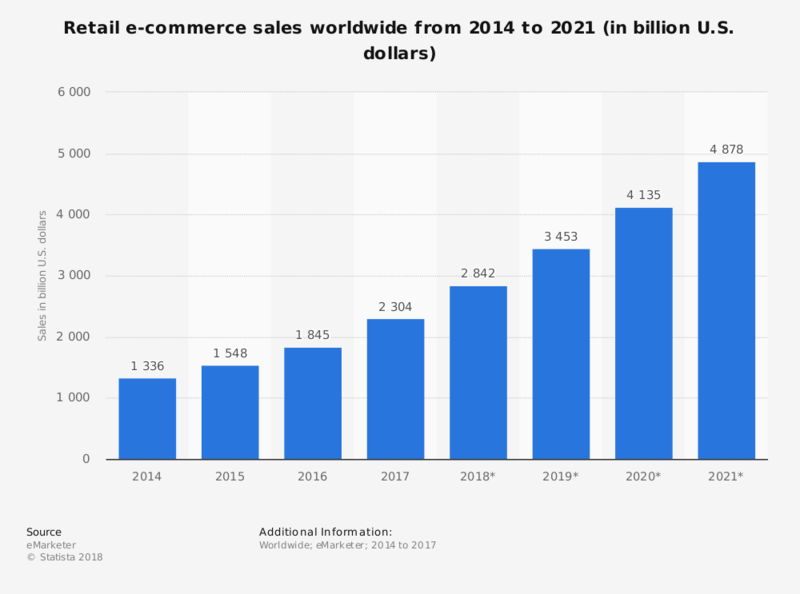 The main imports under this chapter pertains to mobile phones and other consumer electronic equipments which contributes to roughly 25 Billion USD. The entire import is almost a deficit, making this chapter the second biggest net import item for India. The fourth item in the list belongs to the capital goods, engineering equipment, and machinery where we have significant imports at around 38 Billion USD and exports at around 18 Billion USD. So the deficit is around 20 Billion USD. One wonder what more should be done, after missing out on the scaling up at the right time. A solution could be to think about the new technologies that would emerge in next 20 years and start investing early. The policy measures to support infant electric cars industry is bang on. Under the existing system of trade and indirect taxation prevailing in textile and garment sector, does it makes more sense for a Bangalore stockist of apparels to import from Dhaka in Bangladesh over buying from Ranchi? Here's the self explanatory calculation. Assumptions: Bangladesh usually sources fabric from China while an Indian supplier sources fabric from an Indian supplier based in Gujarat/other states. I shall assume that the price at the factory gate of fabric manufacturer for both Chinese and Indian fabric is same - usually Chinese fabric is cheaper. The transportation cost from China to Bangladesh is same as that from Gujarat/other states to Ranchi - usually Chinese transport cost would be smaller. I shall also assume, for sake of simplicity that labor cost in Bangladesh is same as that in Ranchi, while a ballpark analysis tells that Bangla labor is cheaper by 40% over Indian labor. 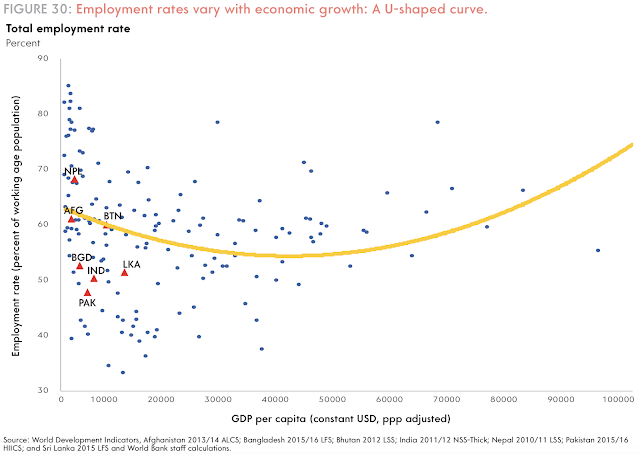 From the above, it appears that Dhaka has a clear advantage over Ranchi despite adverse assumptions towards Dhaka. Before GST, the IGST component paid at border was not refunded to the importer. That barrier was significant. Did all this add up in the end? Did the imports really rise for apparels after introduction of GST? The below graph for pre and post GST quarters of import under ITC-HS 61 and 62 (apparels) from Bangladesh into India is self explanatory. The red tick is the point where GST was introduced. Looks like Dhaka is indeed making sense over Ranchi and all other apparel cities of India. Edit 1: Thanks Moin for pointing out the error in calculation. Rectified now. Imports over the period has grown faster than exports of merchandise and services. To that extent, the trade deficit worsens. What is noticeable is that even in services, the trend is following merchandise in terms of imports growing faster. 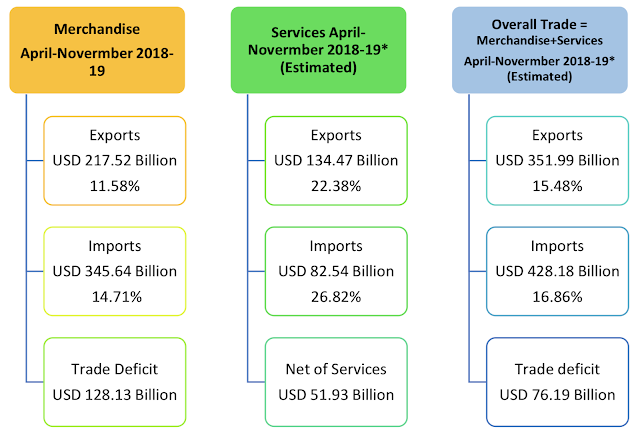 India maintains an overall services surplus of around 70 Billion USD per annum that helps bridge the merchandise trade deficit of around 200 Billion USD (other gap-filling coming through various forms of capital flows). Since 2013, when the exports last grew significantly, we are stuck in doldrums in the range of around 300 Billion USD exports. The government has exhausted all traditionally available means of cajoling exports to grow. The exports has simply not grown. Also, the constituents of exports have also not changed significantly. As I predicted, the weakening of rupee has not made exports grow; it takes more than a year before weak currency effects starts to show on actual trade. I have a feeling that we squandered away the recent good three years of global export growth wave when many countries saw their export boats getting a lift. Demonetization and lack of sensitivity towards exports while launching GST were two contributing factors, apart from credit squeeze in Indian market. Possible financial recession, it's been a good ten years now since the financial crisis. The trigger could be anything from Italy's budget, Saudi Arabia/Iran/Middle East, US/China tensions, Latin America, or even a botched up Brexit. Here are the items that grew in terms of exports and imports during September. 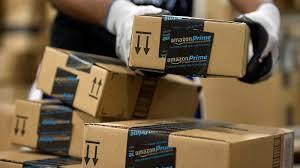 E-commerce policymaking in India is a story of missed chances. 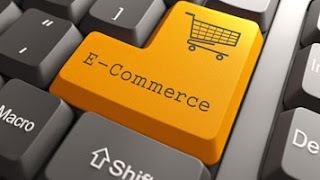 As late as couple of months ago, the government was in the process of setting up a think-tank to formulate national E-commerce policy. It would take another six months for the rough contours to be formed, and for the interdepartmental heads to come to some kind of consensus, or not. 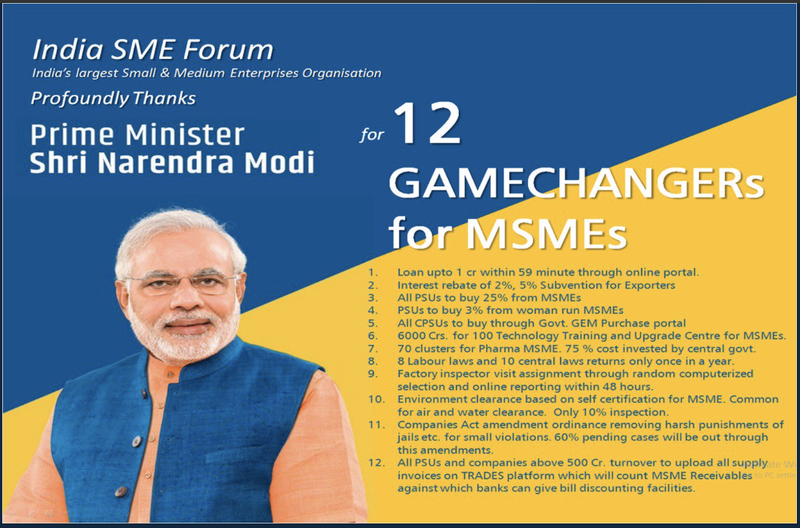 A reason for not formulating a national policy was that the area of B2C E-commerce is handled by various ministries/departments ranging from India post, RBI, commerce, industries, finance and IT. Coming as late as it would, even if it comes within scheduled time, it would still make a good joke but for the fact that it is true. To put things in perspective, we are at a stage where India has been reduced to a marketplace for plunder by multinationals. 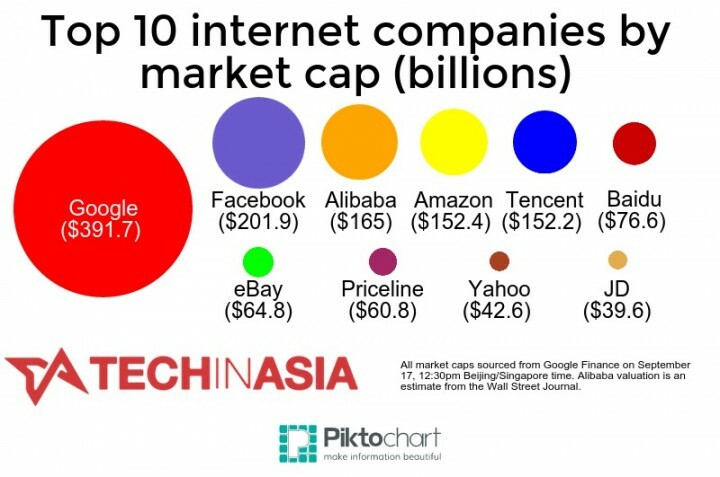 On one had we have what The Economist calls the FAANGs (Facebook, Amazon, Apple, Netflix and Google/Alphabet) and on the other we have the Chinese BATs (Baidu, Alibaba and Tencent). The FAANGs peddle their own products in India and the BATs enter like trojan horses through investments in our supposedly homegrown PayTMs, Snapdeals, Olas and Flipkarts. Of course, Flipkart is now sold to Walmart, a deal with the loser label hung all over. Within the spectrum, and probably all over it, hangs the Japanese SoftBank with its might of money and investments in all that's tech and glitters. Chinese have now created a tech fund to emulate SoftBank. Among all this, we have very few E-commerce players that can be called truly Indian or India funded. Reliance is making an entry as per their recent announcement but then we have to actually see how it rolls out. China has been as clever as ever with its E-commerce policy. They effectively banned FAANGs from China and let their domestic firms build up capacity in the area. Whenever they let someone come through the Chinese wall (e.g. Apple), they ensured that they acquired the required technology to put up a competitor (Xiaomi and others). That's as foresighted as one can get, especially when it comes to policymaking in areas that exist at the cusp of various departments. It's not only their domestic policy that has clicked, but even their exports are an E-commerce success story. That's why when China earmarks ten areas of technology that it wants to dominates through its China 2025 plan, one needs to take notice and prepare. Lest it be misunderstood, it's not that China has got everything right. The BATs are struggling outside China and the overseas markets add less than ten percent to their bottomline unlike FAANGs who get more than half of their revenues from non domestic territories. Most of the Chinese presence abroad in this area is through investments in third parties and not their own brands. This strategy might or might not work in the long run. And this is where we need to strategise better. The current method of think tanks making reports and joint secretaries from various departments mulling over it till the report twists itself to become what they like won't work. We need an apex body staffed with experts and bureaucrats with sense and direction to sit down and hammer out a policy or strategy. Something like a Technology and E-commerce department within current PMO might not be a bad idea to start with. We have already missed the bus. We are however not yet too late to do some damage control, avoid being a bazaar for the world, and if things go well, get our footing back. If that makes an already rich Ambani richer, it's a small price to pay. A common belief while the Rupee depreciates against USD is that it would help our exports. This ‘weak rupee shall help exports’ is shown as a positive over various negatives arising out of falling Rupee. There is great attractiveness in the argument supported by textbook economics. Undervalued or depreciated currency acts as a direct subsidy for exports while acting as a punitive tax on imports. China used the undervaluation of currency as an effective international trade tool for decades. The undervaluation doesn’t fall foul with the regional or multilateral agreements in the way export subsidies do. However, given India’s situation, it is doubtful if we can have a conscious control on the level of Rupee anymore in light of the central bank’s mandate getting anchored to inflation control. Till some time ago there were calls to depreciate the rupee through direct intervention to help exports. Thankfully the idea is now on the backburner as the rupee has slid on its own, mostly due to the factors originating abroad. In addition, one can never predict a correct level. Rupee at the level of 60 for one USD might be very competitive for services exports, while it may still be dear at 70 for manufacturing sector. 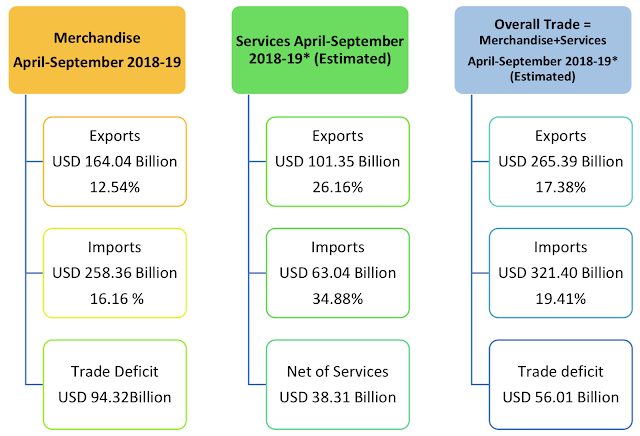 However, a mere weakening of Rupee might not be enough to boost exports, at least not in a significant way when it comes to manufacturing sector due to three possible phenomena discussed here. First, India is no longer an isolated market exporting local goods alone. Our exports are tightly linked to imports through twin mechanisms of input import dependence and global value chains. The inputs for two of our leading exports, Petroleum & derived products and gems &jewellery, originate abroad. Crude, rough diamonds, and gold are imported to make these export products. A significant part of our non-petroleum, non-jewelry based manufacturing exports are tightly linked to the global value chains. We import various steel products, automobile parts, engineering and electronic components that are processed and assembled before getting exported. Except raw material, primary forms and agricultural exports, we have few items where the origin is fully Indian. Given this scenario, any depreciation of our currency works both ways. The gain would be only to the extent of value addition that happens in India. Second, there appears to exist a counter-intuitive effect of weak local currency not helping exports that arises due to the choice of invoicing currency (Gopinath, 2015). 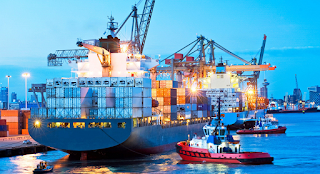 Almost all our exports are invoiced in international currencies such as USD, Euro or Pounds. Assume a case where the price of a certain export good is agreed at 100 USD for the coming quarter. The goods are invoiced at this price in USD for all shipments for the quarter. If the Rupee weakens meanwhile, this invoicing method would lead to windfall profits for un-hedged exporter during the period (and commensurate pain if it strengthens), but it does nothing to change the underlying competitiveness. An item, which was invoiced at 100 USD earlier, continues to do so in international markets even after weakening of rupee, unless the terms are renegotiated between the exporter and buyer for the quarter. It is seen from the study that the weak exchange rate effect may take upto two years (http://www.nber.org/papers/w21646.pdf) to trickle down into the local non-invoicing currency. This time zone while prices are renegotiated is the profit zone for Indian exporters. The process of renegotiation and adjustments is a medium to long-term process and therefore we don’t see an immediate advantage in terms of trade despite a fall in value of rupee. There is no change in the level of attractiveness of sourcing from India for an international buyer. Therefore, it doesn’t boost exports in terms of quantity or exports in terms of USD.Only value of exports in terms of Rupee shoots up to the extent of depreciation while the effect lasts. The invoicing of international trade in foreign currency is therefore a disadvantage for us, as it doesn’t let our competitiveness improve automatically and immediately upon depreciation of Rupee. Unless the exporter consciously uses the windfall to mark down the prices, or uses it to boost productivity, there’s not much hope. However, arising out of the same study, there are further two negativespossible. First, the import costs shoot up almost immediately as the invoicing is done in foreign currency which now needs more Rupees to buy. This leads to inflationary pressurearising out of inelastic imports such as crude for a country like India. Second, it adds to the cost of inputs that go into export products in the value chain, thus eroding margins. There appears to be nothing much we can do about the way the trade invoicing is done in foreign currency. Third, there are also doubts about correlation between a weak rupee and manufacturing exports. It was found that a fall in the value of rupee didn’t lead to an expected commensurate gain in manufacturing exports during the period 2004-2012 (http://www.nipfp.org.in/media/medialibrary/2013/04/WP_2013_115.pdf). 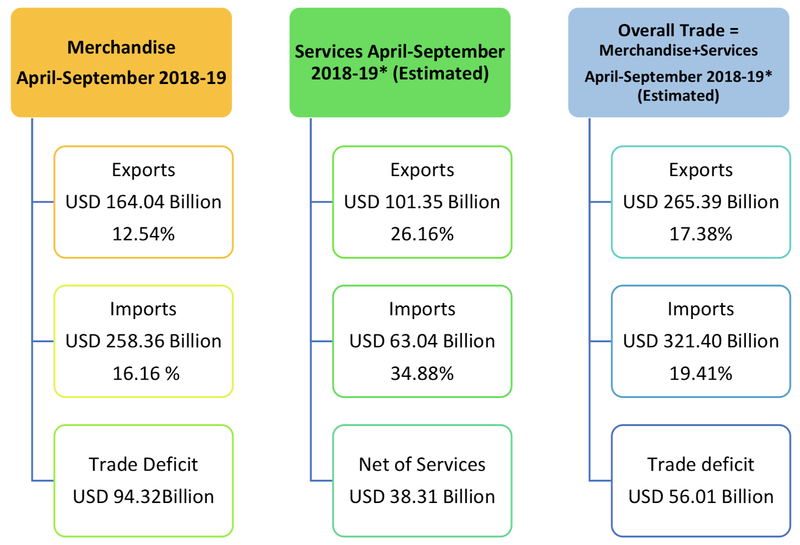 This weakness in the correlation between a weakening rupee and increase in manufacturing exports may be an outcome of combination of factors, including the integration into global value chains which makes the exports dependent on imports. As the sensitivity to exchange movement is faster on imports, and slower on exports, the weak correlation is not a surprise. At least the Indian experience attests to it. In short, one cannot rely on a weak rupee alone to boost exports. We need to look beyond at structural factors and take a sectoral approach to boost competitiveness if the aim is to improve export performance. The central government has taken various steps in this direction, significant among them being the collaboration with the state governments in order to take a micro sectoral approach at the level of clusters and districts. While the steps produce results, we may discount the expectation of a weak Rupee boosting exports. India has recently become member to Wassenaar Arrangement (WA), Australia Group (AG) and Missile Technology Control Regime (MTCR), the three leading export control regimes in the world. The memberships to these bodies reflect acceptance of India as a responsible growing power, and an acknowledgement of impeccable non-proliferation record that India has maintained over decades. However, a mere membership doesn’t confer the desired benefits unless India walks the extra mile to harness the technological benefits these agreements confer. Lest it be misunderstood, one must state here that India has shown tremendous self resolve to develop technologically despite non-cooperation from leading technology powers over decades, especially in the area of missiles, space and computers. However, with the membership to the technology control groups, we may now look forward to develop as a partner and a leader in future if we strategize and work towards it in mission mode. The export control multilateral agreements seek to control the proliferation of dual-use, advanced military, space and sensitive technology from falling into the hands of rogue nations, terrorist groups and non-member states. They have their genesis during cold war era, but have continued in altered forms to the present. India has suffered for want of such technology for decades while being a non-member. The non-availability of advanced technology hampered India’s fast technological advancement in the past as she was forced to develop most of the required technology indigenously. While in few areas we did well, we suffered in various defense related technology development. It is difficult to measure the exact impact of technology denial on development; one may reasonable surmise that we must have lost decades of manpower reinventing the wheel. India has now set up a reliable and effective export control system for controlling the export of sensitive technology from India in line with the best practices of the member countries. The outreach with the industries has ensured that partner industries, especially in the private sector, understand the sensitivity of technology transfer to non-member states. Various arms of the government work in tandem to ensure that India adheres to the commitments in letter and spirit. The number of applications for exports under these arrangements has soared up in recent times, indicating the fact that there is a good awareness of export control requirements, and that India is integrating into the technology regime. Many of those who are exporting the technology products are private sector players, which is a positive development. Yet this is not enough. India needs to strategize to gain more from the memberships to these groups. The membership opens up a world of opportunities for technology up-gradation that was not available earlier to us. For effective utilization, India should move on two fronts. First, we should do a SWOT analysis to identify the fields in which we are lagging when compared to the member states. A team of experts should be constituted in each such area in terms of technology verticals. A collaborative R&D setup including universities, research institutions and industry should be established to get the technology at the working levels in each vertical into the country. At times, some of the technology might not have any takers in the industry. Even then, the technology should be mastered at the research institution levels. For example, in the area of some of the high temperature alloys used in turbines and missiles, we should establish research foundries that can produce these alloys and develop the knowledge base for industry transfer whenever need arises. Similar arguments can be made in the area of advanced manufacturing, 3D printing, armaments and defense equipment, software, drone technology and so on. The list is endless. Second, we should develop deeper linkages with friendly member nations for technology collaboration and transfer. India has developed as an important export market for the member states. The membership is an attestation to our growing potential as a market for technology products, in addition to our credentials as a non-proliferator. We need to leverage our position to collaborate and grow. While India would certainly benefit from technology transfer, our technical manpower and expertise would help the member states too. It would be a two way street in the long run. We should use the membership for developing and integrating into the technology value chains in defense and advanced technology areas. It is important that India strategizes and moves actively to harness the benefits arising out of these memberships as early as possible. Otherwise the membership would simply end up as a decorative feather in the cap with marginal utility for a handful of public and private sector players who fulfill defense offset requirements and elementary technology exports that fall under export controls.